UPDATE: Please notice that the official dates are changed from July 29 to Aug. 4, Sunday. The July 29 to Aug. 3 program with the cultural festival in the Jeju City on Aug. 3 is same. But people will gather in Gangjeong on Aug. 4 to create a human chain between the east and west tips of the naval base construction area (1,500 km) from noon to 12 pm. Click here for more details on Human Chain on the day. Dir. Cho Sung-Bong, a movie director, currently works on the acclaimed documentary on Gangjeong titled, “The Gureombi Wind Blows,” will take air camera shots on human chain scene using unmanned helicopter and will put all the names of participants in the movie’s ending credit. Even though you may not be able to physically join the march and human chain. please send us international solidarity messages(up to 100 words)/photos/videos through gangjeongintl@gmail.com by no later than July 20. All the messages will be publicly shared. Please see the bottom for the details of optional programs after the human chain on Aug. 4. Click the poster for a larger version. * Internationals who can physically join the march and want to contribute the march with one’s talent/work, please see the below translation. * Thank you to be with us! 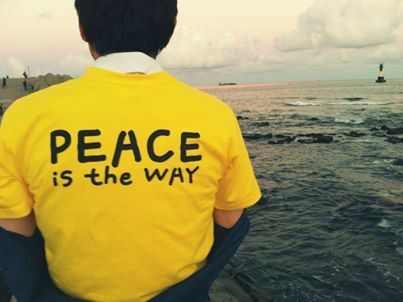 Now, we, succeeding the year of 2012, want to propose to gather people’s voice for peace once again. 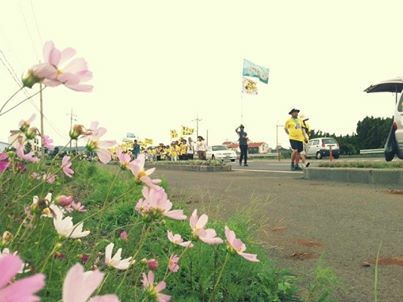 We are to gather the voice to inform the injustice of the Jeju naval base project and to appeal for peace to be saved, while we walk around of the spots of Jeju for five nights six days during the hot summer. 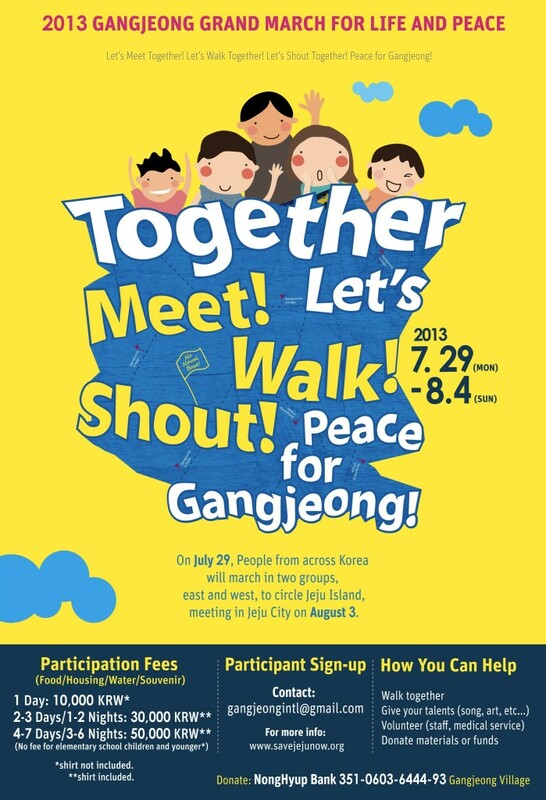 Please join the 2013 Gangjeong Grand March for Life and Peace in which we feel pain together, walk together, and talk on our peace together! Please be a part of one strong voice for peace, again! ▶ Encourages its members to join the march and organizes support material and fund. ▶ It is planned that each co-sponsoring group is individually named in poster, web poster and media. -It is to form a public discussion on the possibilities of militarization of Jeju by the Jeju naval base project and of occurrence of military conflict in the northeast Asia. It is to expand to the public the need of continuation of the struggle to stop the naval base project. -It is to share the mutual relationship among state, human rights, democracy, we remembering that state violence during the 4·3 uprising is recurred during the current enforcement process of the naval base project . 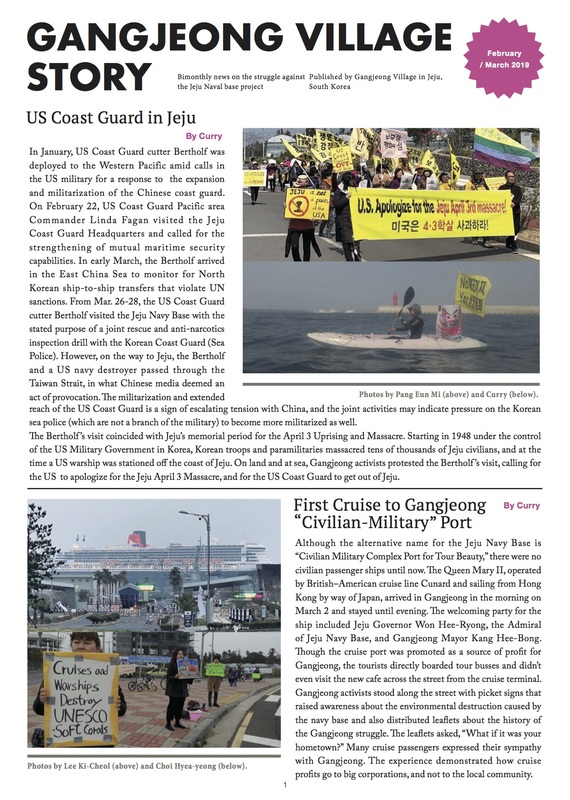 -Sponsor: The Gangjeong Village Association, Jeju Pan-Island Committee for the Stop of Military Base and for Realization of Peace Island (31 groups), National Network of Korean Civil Society for Opposing to the Naval Base in Jeju Island (11 groups) etc. -People will be divided by east and west teams. The pilgrim will be focused on the inner roads of towns. – Some figures concerned with Gangjeong will be asked to join the march as the members of the Peace Representative Board. Internationals can pay in cash on the very day(s) of participation. An individual should prepare for one’s sleeping bags etc. – It will be about 20 Km march a day. – Detailed course will be known later. – Sleeping bag, washing stuff, hat, individual tent(choice) etc. – Main content: resolution speech, sharing meanings, introduction of participants, concert, peace ceremony. – Collecting sea water in the main march regions: Water will be collcted in cermony in the festival.